The EmailValidator component verifies if an email address is valid, properly formatted and really exists. This component uses different levels of email tests: it can check the email syntax, test the domain availability, check whether the SMTP service is available and, finally, check if the mailbox exists. The Clever Internet Suite library includes a special component, EmailValidator, by using of which you can check the email syntax, mail server existence and it's availability. In some cases, you can check whether the specific user has the mailbox on this server and whether this mailbox can accept mail. You can set up the desired validation tests by using of the ValidationLevel component property. Check whether the mailbox is available. See the EmailValidationLevel.Mailbox (vlMailbox) option. The component connects to MX server and sends the "RCPT TO" command. If server rejects this command, the validation fails. Please note! When you set the validation level, the component always performs all previous validation levels as well. E.g., if you set the EmailValidationLevel.Domain level, the component performs 1, 2 and 3 steps above; if you set the EmailValidationLevel.Smtp level, the steps 1, 2, 3 and 4 are performed, etc. Since the component performs all previous validation tests, the email may fail any of them. You receive the corresponding validation result. E.g., if you set the ValidationLevel to EmailValidationLevel.Smtp and the Validate function returns EmailValidationResult.DomainOk, this means that the email passed the validation steps 1, 2 and 3. But 4 was failed. So the result may be interpreted as follows: the tested email is not blacklisted, it has valid syntax and the email domain has valid MX record. But the responsible SMTP service is not available on the Network. This may be temporary error or some IP access problems. If you run the EmailValidator on the PC from which you plan to send messages to this email address, this result indicates that your message will not be delivered. Note: this is true for relaying the message directly to recipient's mailbox in the save way as an email server does. In case if you set the validation level to EmailValidationLevel.Mailbox, depending on email address, you may get any of validation results. 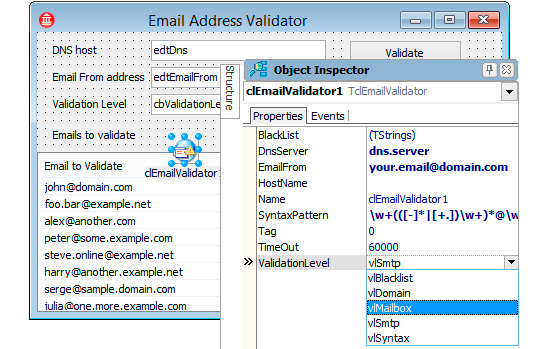 Ideally, you get the EmailValidationResult.MailboxOk (vrMailboxOk in Delphi) result. Please note, if you run the EmailValidator on your working PC, the Mailbox validation may fail because email servers block connections from unknown hosts (see the note above). So the best way to pass this validation test is to run the EmailValidator on the same PC as your own email server runs (from which you plan to send emails). To successfully pass the Mailbox validation, you need to set up both the EmailFrom and HostName properties. The EmailFrom specifies the sender email address that will be used in the "MAIL FROM" command while MailBox validation. The HostName is used when connecting to the SMTP service.